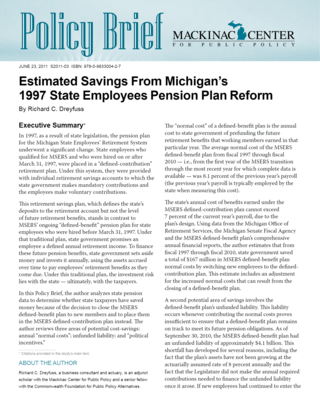 Since March 31, 1997, new state employees who qualify for the Michigan State Employees’ Retirement System have been placed in a 401(k)-style “defined-contribution” retirement plan, rather than MSERS’ traditional “defined-benefit” pension plan. Under the new arrangement, state government makes mandatory contributions to employees’ individual retirement savings accounts, but does not guarantee employees a defined retirement income, as it did under the traditional plan. In this Policy Brief, the author analyzes state pension data to determine whether state taxpayers have saved money as a result of the switch.